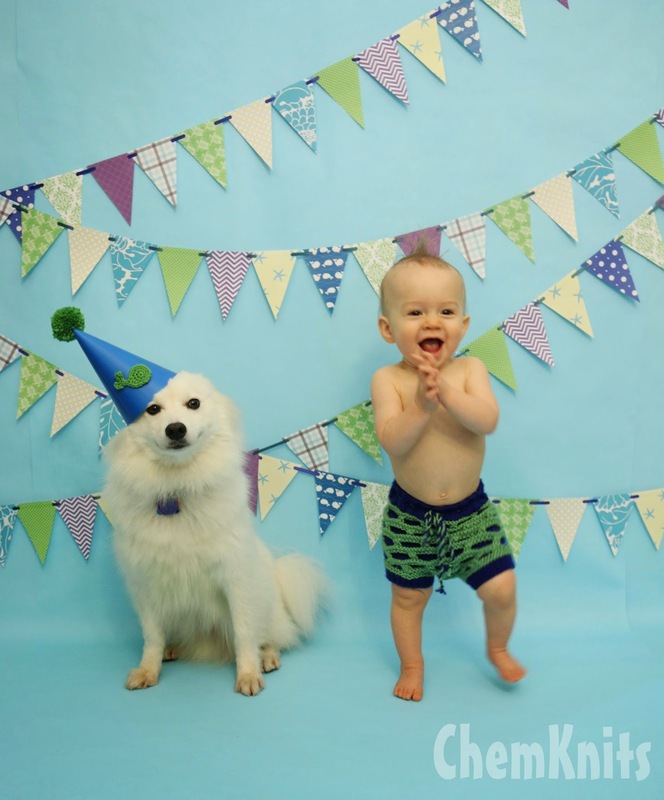 I recently posted about Lucky's Under the Sea First Birthday Party. For months I've been talking about the preparations and different crafts I made to make the day special (admittedly mostly for me and Keith.) The party took place on the weekend after Lucky's birthday. For his birthday itself, I had a whole cake smash photoshoot planned. I scoured Pinterest and Etsy for the best backdrop ideas, looking for things I could do myself inside my home. I even took a photography class (although mainly because I wanted to learn how to use my Canon EOS 70D Digital SLR Camera ) and got tips on how to add more light to no natural light, practically a basement aparment. I purchased three clamp lights from Home Depot (I think they were around $7 each). I this post, I will share the physical setups I used to achieve different shots. Now I want to add a disclaimer that I am not a professional photographer. Not even close. 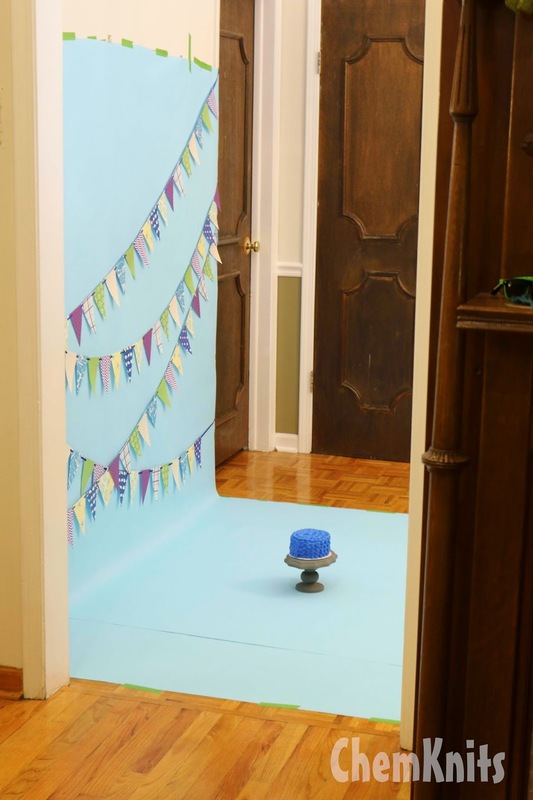 There are probably better photography tutorials out there, but I thought that it might benefit some people to see how I set up the cake smash photoshoot, and the trials along the way. Indy is a trooper, and he always helped me set the scene. Indy was a valuable asset in these practice shots. 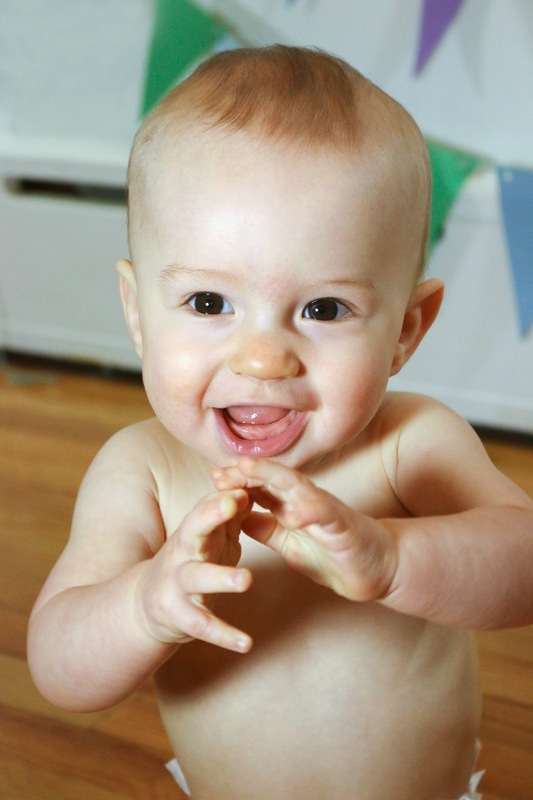 I would check my exposure the white balance on Indy before bringing the baby into the shoot. When Lucky woke up from his nap, I tried to sit him down and take some shots. Now he was newly mobile at this point, and I quickly realized how hard it would be to shoot a moving target. I would especially need to make sure to have some width to my backdrop. It was a lot easier to shoot Lucky before he was mobile. I used to be able to just sit him in position and then click away until I got the shot. Now that he is a toddler (gasp! he is still my baby!) I have to employ other tactics to get him to stay and look at the camera. It really helps to have another adult on hand to stand just behind you and the camera. My husband, Keith, will talk and sing to Lucky, making him smile and look at the camera. Keith also functions in the "put the baby back in position" category. 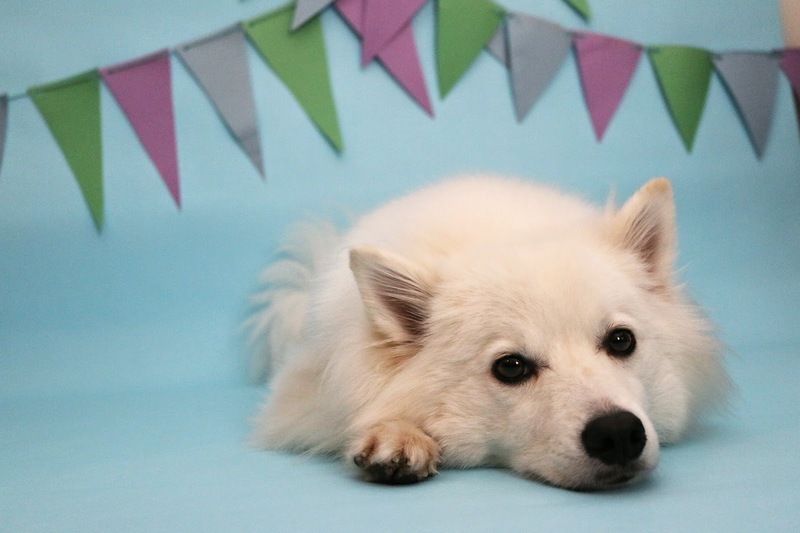 Lucky also enjoyed the balloons so it was hard to keep his attention. In the end, I didn't like the shadows the lights created on the balloons. I decided to test out some pennants. A few days later I set the scene with two different sizes of pennants on the wall. I did learn that I liked the smaller pennants better than the big ones. Once again I pointed the lights directly at my subject, but I was still not a fan of all of the shadows I created. I ordered some Pacon Fadeless Art Paper 48" x 50 ft in Light Blue and decided to retry the pennants on a smoother surface to see if that made a difference. I attached the paper to the wall and floor using painter's tape. While testing with Indy, I made another decision. Instead of pointing the clamp lights directly at the subject, I would point them up. This gave the room more light (allowing me to use a faster shutter speed to capture my toddler) PLUS eliminated the shadows. I'm much closer to what I wanted to achieve. Suddenly I am in a set up that is starting to look more professional. The light blue paper worked amazing for a background. I also ordered a roll of black paper to use in a Halloween shoot. The black was much harder to work with because wrinkles showed up more and it was hard to photograph "true." In post processing it didn't matter if the blue was slightly off, but you could really tell if something wasn't right with the black. If you want a black backdrop I would try to find some matte fabric. The big day was here! The night before Lucky turned 1, I worked to set up the pennants and backdrop. There are three pieces of paper on the wall: two overlapping and a third in the center which ended up being extraneous. I was hoping to minimize the amount of seams that you could see, but I ended up not removing any in post processing. (With the black paper you really see where the paper overlaps.) 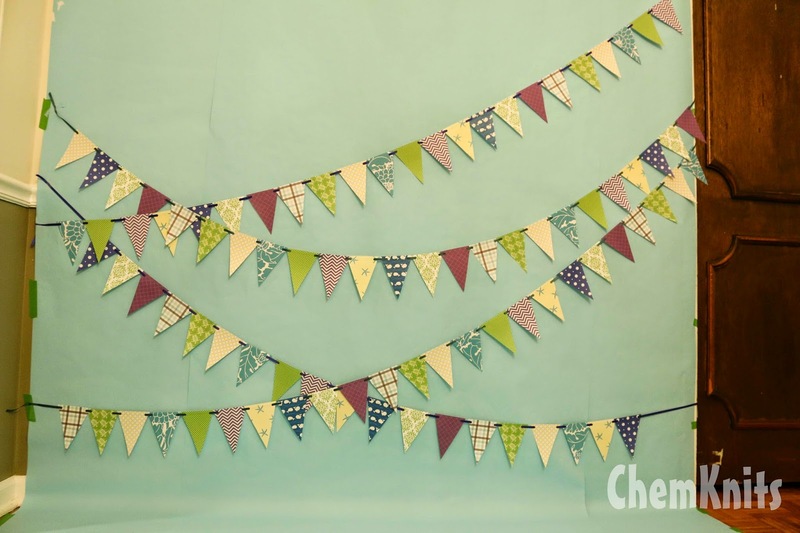 The pennants were created out of scrapbook paper hole punched and threaded onto some ribbon. Lucky was walking by this point, so I needed to make sure that we would have plenty of light. 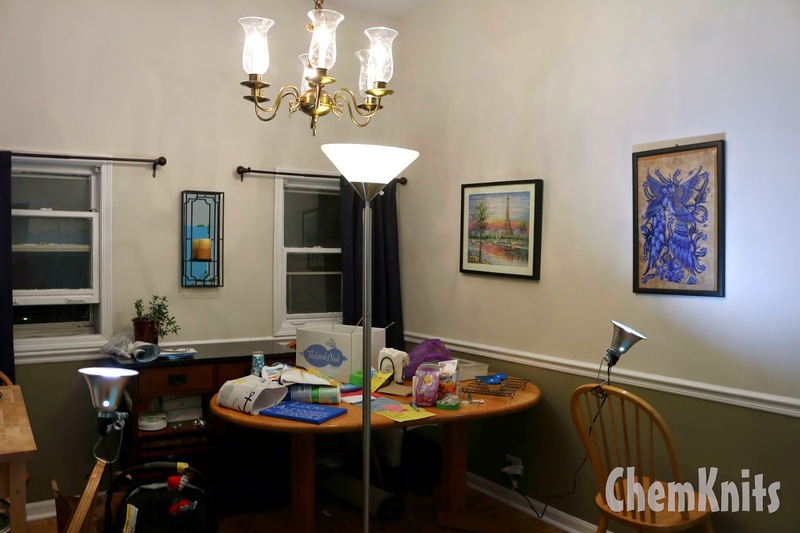 I used all three clamp lights, a tall floor lamp and the overhead chandelier. 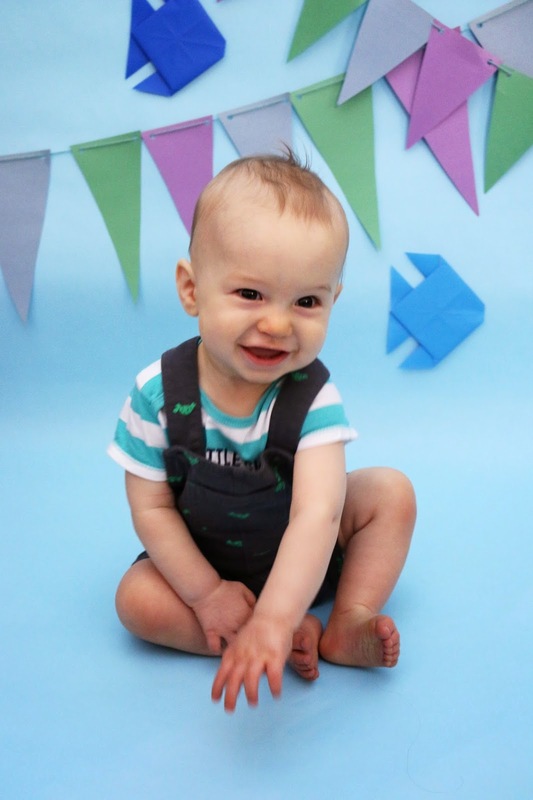 Another benefit of the paper backdrop - when Lucky smashed his cake it would be really easy to clean up! We made sure to break up the picture taking so we could also do some fun things like play in the park and nap. We did a few sessions of Lucky in different outfits in front of the backdrop before any cake was served. This shoot would NOT have been possible without Keith. I really needed another adult to keep putting Lucky back in the center of the room while I lay on the floor shooting as many frames as I could. I think I took almost 1000 pictures this day! Remember, you can always delete but you can't go back in time and take another shot. Indy was, of course, a trooper through the whole thing. Next week I'll share with you more pictures from his photoshoot.